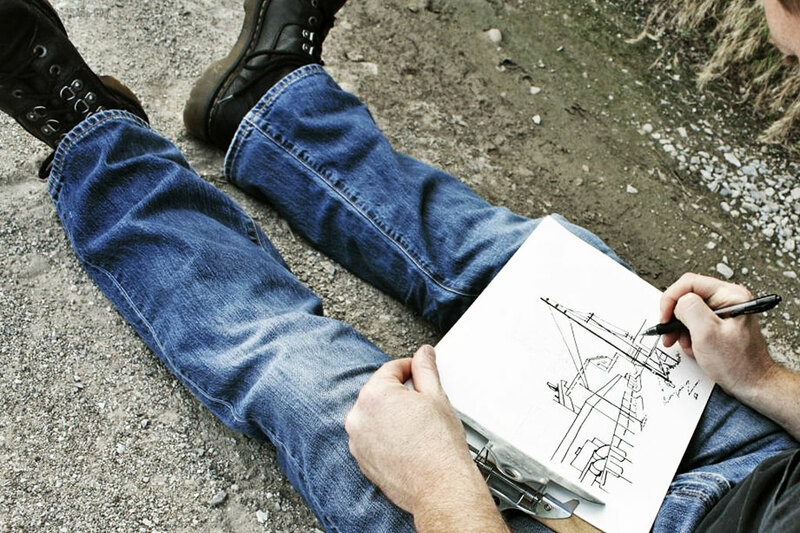 No deadlines, no expectations, just an exercise in creativity. 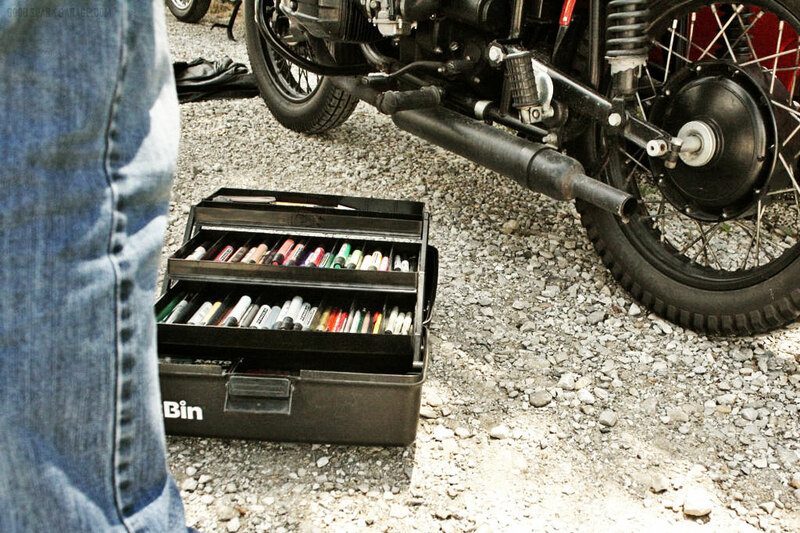 The plan: Use our motorcycles to scout out a location where we can sit down with our sketchbooks, relax and draw. 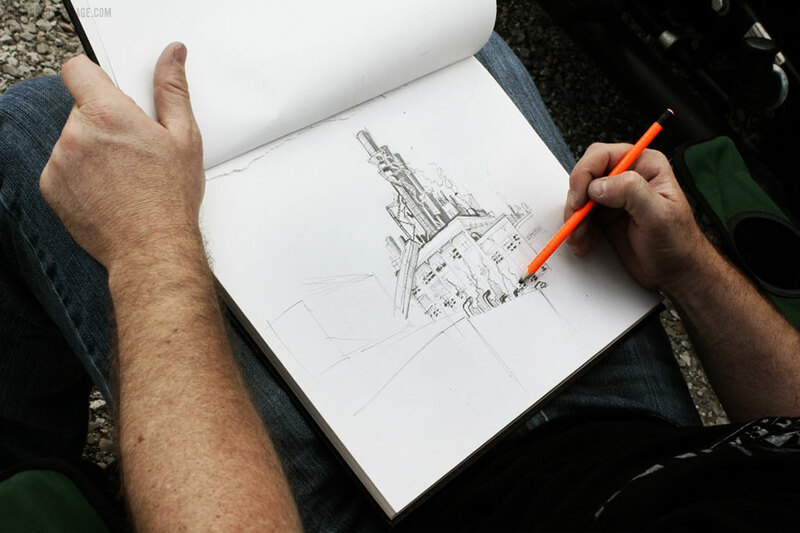 We planned to meet up with our illustrator/motorcyclist buddy, Chris, and allow our kindred artistic spirits to sketch outside the four walls of our daily gigs. Where’d we end up? 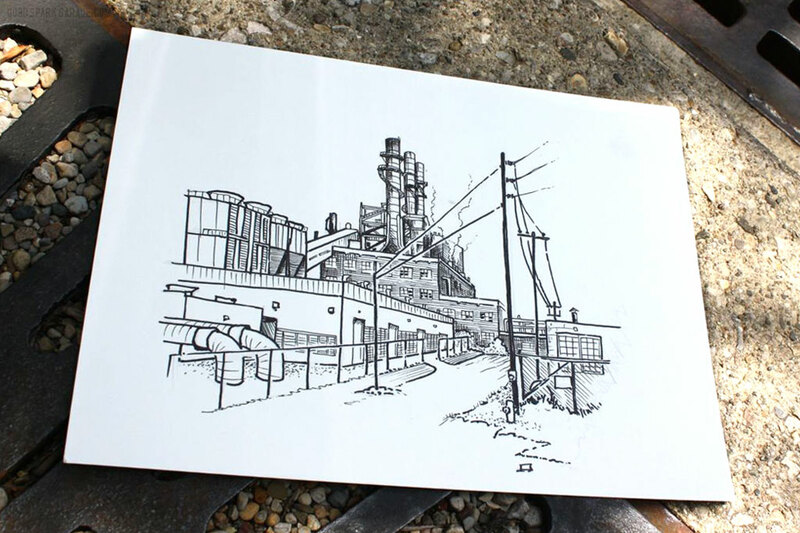 We’re lucky to enjoy our careers as graphic designers and Chris is an accomplished illustrator by trade, but today we’d go back to our younger days when we did more sketching simply for the joy of sketching. Casey rode his KLR650. Chris rode his R60/2. 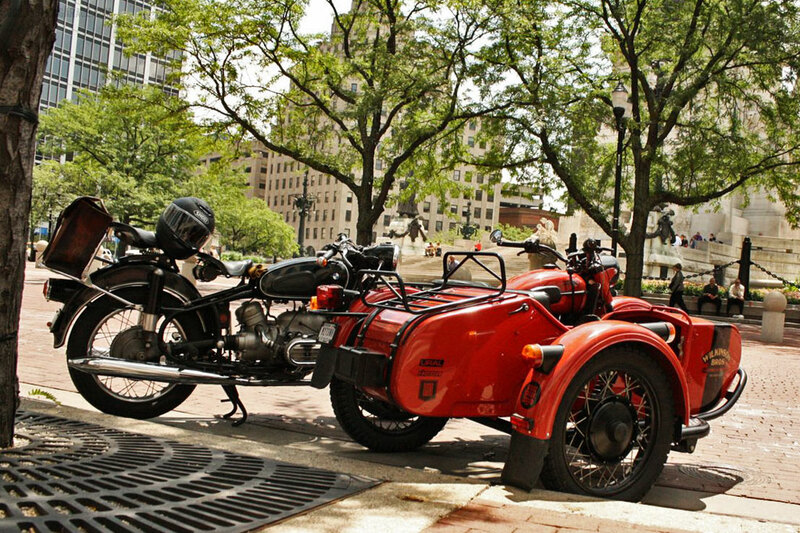 Corey rode the Ural sidecar. 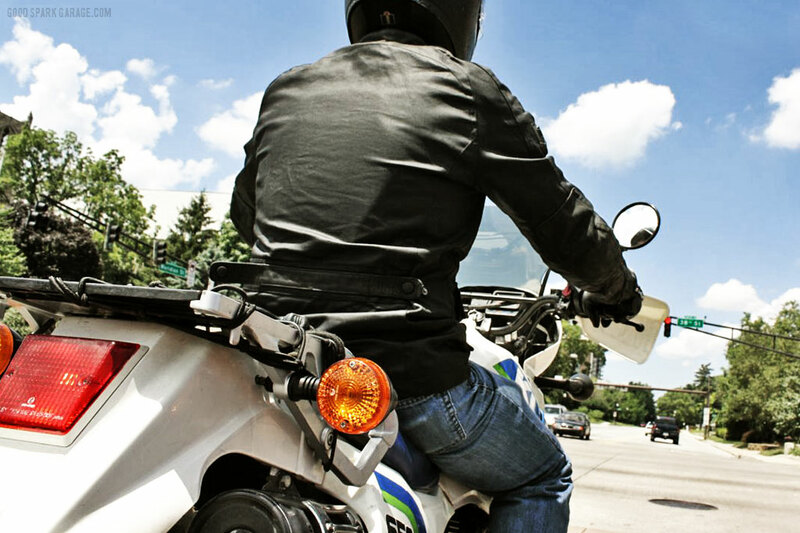 We like to connect the dots of excursions like this via motorcycles. Art is fun enough for us right-brained folk, but using bikes for all the to-and-from trips is icing on the cake. It extends the time you’re not under a roof. 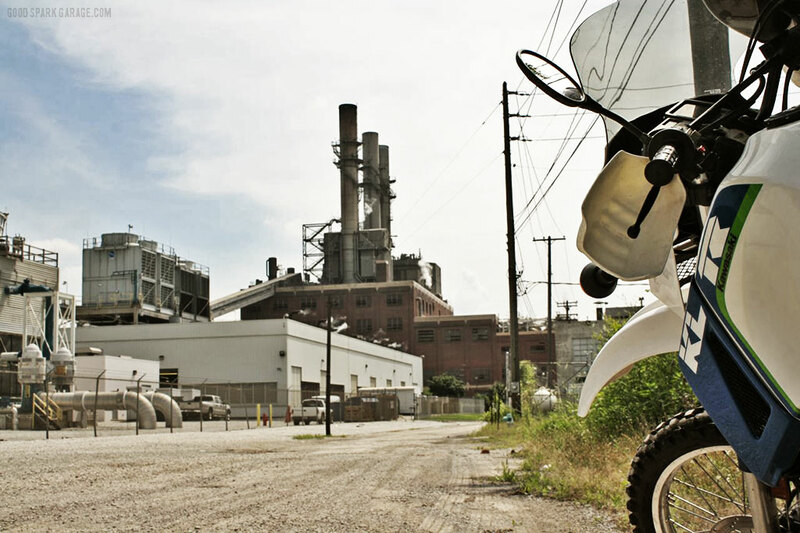 We chose a gravel lane just off of West Street in downtown Indianapolis with a wonderfully industrial view (above) of the thermal energy chilled water plant. The facility’s one-note whoosh was intensely loud, but it drowned out any aural distractions. 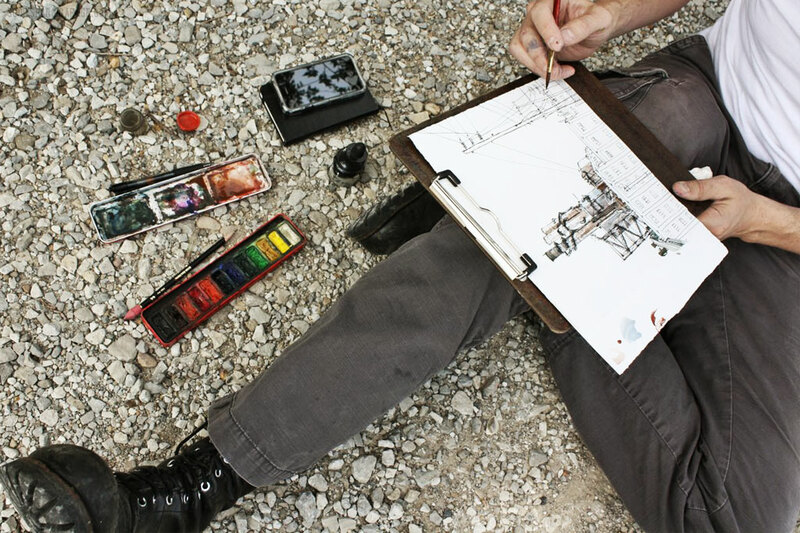 Corey lays some ink over his rough pencil sketch. Casey roughs in the details . Chris adds a wash of color to his study. 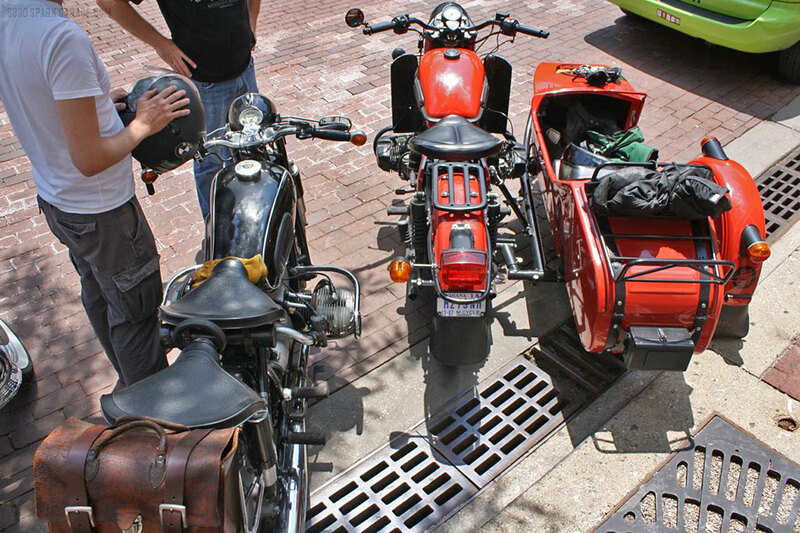 The Ural acted as a good supplies hauler. Corey’s ball-point pen and Sharpie results. Casey’s pencil and marker color study. 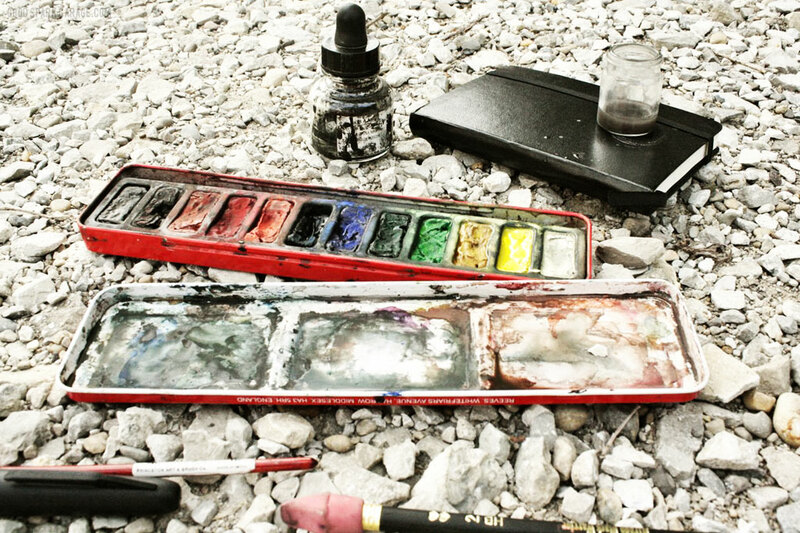 Chris’ pen and watercolor composition. Casey and Chris talk shop on Monument Circle in downtown Indianapolis. 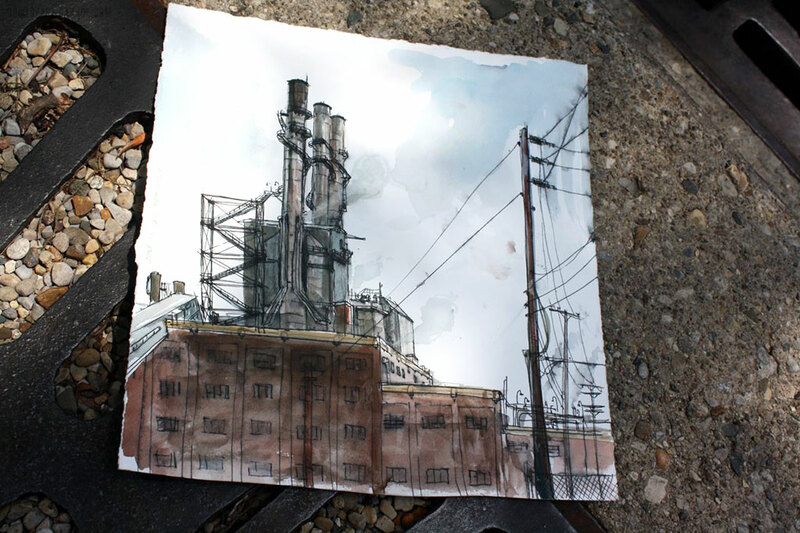 This ride ‘n sketch session was an exercise; an opportunity to find an impromptu location and draw it. 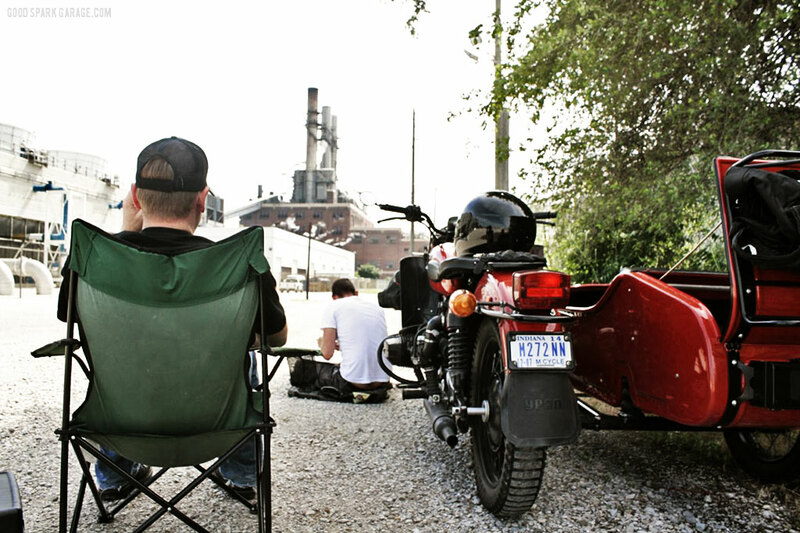 It’s also an excuse to get out and explore on motorcycles to see where back alleys lead or what’s off the beaten path. We concluded the gravel lane drawing drill and headed toward the “circle” in the heart of downtown Indy for some lunch. 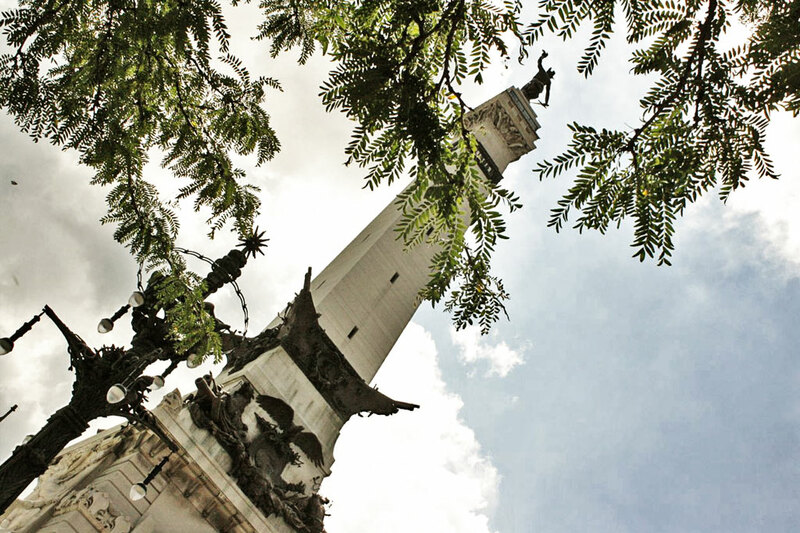 We sat and ate in the shadow of 284-foot tall Soldiers’ and Sailors’ Monument, a neoclassical homage to those who fought in American wars. Finished in 1902, this monument is the first in the United States to be dedicated to the common soldier. As for what location or subject may be next, who knows. 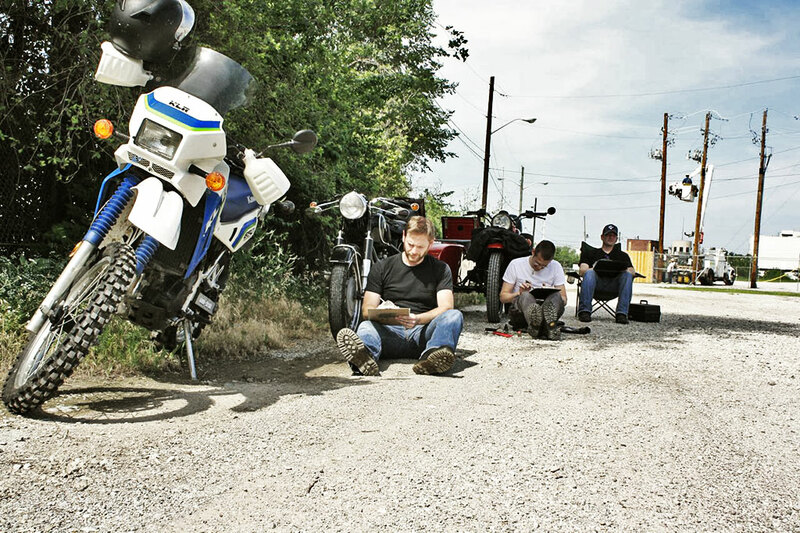 What’s certain is, this sketching excursion primed us to plan another session of motorcycling and art. 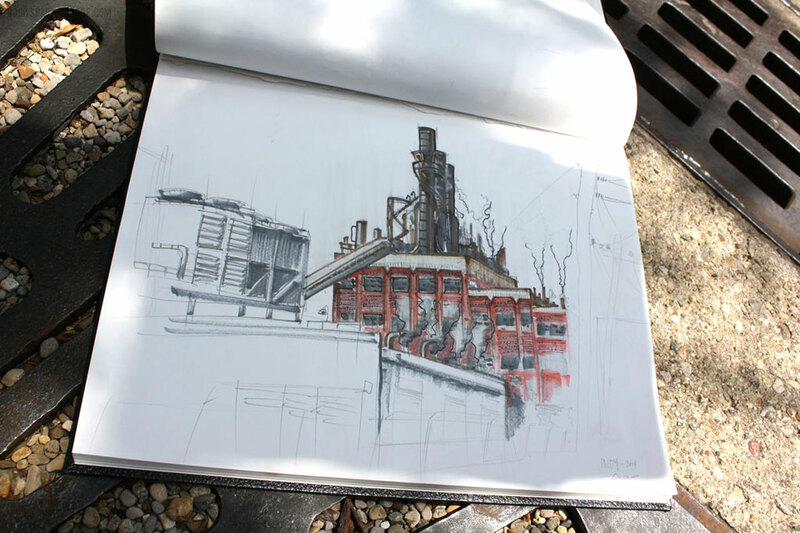 We hope this inspires you GSG readers to pack up a pencil and a sketchbook, hop on a bike and go find a scene to absorb and record. Don’t draw? Bring a good book, write a poem, play a guitar. 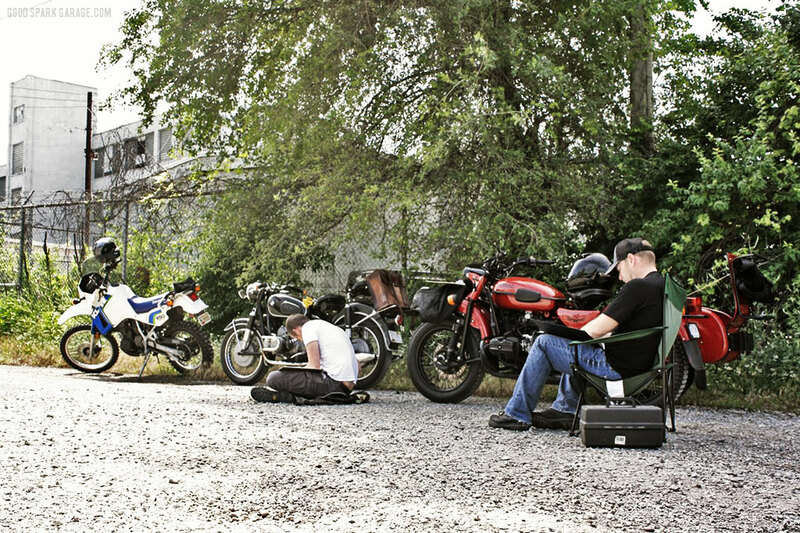 We’re bettin’ the experience will be heightened if a motorcycle is your transportation to a creative escape. Corey Wilkinson and Casey Wilkinson are illustrators and graphic designers who run Wilkinson Brothers, Inc. and Good Spark Garage. Chris Sickels is the mind and creativity behind Red Nose Studio. Neat!! !… I regret not maintaining my drawing / illustration skills after leaving school 20 years ago. Even then I had to work at it. Thanks. Very inspirational. My motorcycles are excellent exploration vehicles- a V-Strom 650 and a KLR 650.